You are here: Home / Collections and Curiosities / "Prexy on the Half-Shell"
President Henry Noble MacCracken's daughter, Maisry MacCracken '31, with help from her nephew, Michael MacCracken, has traced the story of a tribute to her father by sculptor Korczak Ziolkowski. Korczak Ziolkowski was a sculptor of Polish descent who was born in Boston in 1918. He was orphaned at age one and grew up in a series of foster homes. On his own, he became an apprentice pattern maker in the shipyards on the rough Boston waterfront, also experimenting with woodworking. Although he never took a lesson in art or sculpture, he studied the masters and also began creating plaster and clay sculptures. In 1932, he used a coal chisel to carve his first portrait, a marbled tribute to Judge Frederick Pickering Cabot, the famous Boston juvenile judge, who had befriended and encouraged Ziolkowski and introduced him to the world of fine arts. Moving to West Hartford, Connecticut, to set up his studio, Ziolkowski received commissions to do sculptures from Boston, New York, and throughout New England. His Carrara marble portrait, “Paderewski, Study of an Immortal,” won first prize by popular vote at the 1939 New York World’s Fair. In 1939, he was asked to assist Gutzon Borglum at Mt. Rushmore. The two sculptors became close friends during the summer of 1939 when he served as Borglum’s assistant. 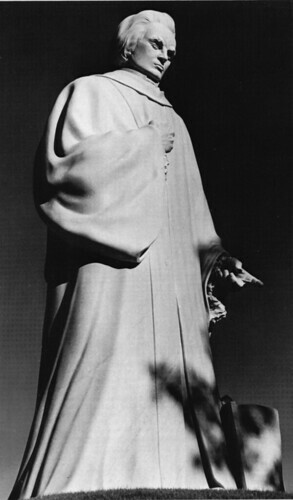 After returning to Connecticut, he carved a 13 ½-foot statue of Noah Webster, which he made for the community of West Hartford. The work drew national attention, but Ziolkowski's fiery temperament and a scornful quotation from Webster that he incorporated in the statue embroiled the community and the sculptor in controversy, perhaps foreshadowing what was to come at Crazy Horse after he accepted the Indians’ invitation to create the Crazy Horse Memorial. Our family came to know Korczak Ziolkowski because his first wife, who came from a very prominent familty, was a student at Vassar. She knew our family very well, and she used to come to the house a lot. The guest book at our Connecticut retreat at Yelping Hill records a visit of Ziolkowski and Dorothy Brewster Comstock on August 3, 1934. Her family lived in Hartford, and she had met Ziolkowski and fallen in love. Her family did not want her to marry this Polish sculptor, and Prexy had to work to negotiate the family disagreement, finally helping to gain approval for their engagement and to arrange for the wedding ceremony, in which he assisted. In appreciation for Prexy’s efforts, Ziolkowski wanted to present him a gift. So, he sculpted his image. The rock it was carved out of was about 3 by 3 feet and about a foot thick; it weighed a couple of tons. 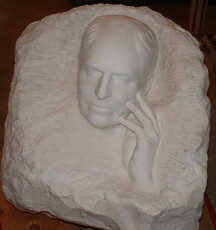 After Ziolkowski left, Mother named the sculpture “Prexy on the Half-Shell” because Father’s face was sculpted in a depression in the middle of the rock. You could make out that it was his face, but it was rather strange seeing Father’s face seeming to come out of a rock. When Mother and Father left the President’s house when he retired in 1946, they left the sculpture in the basement. Eventually it was moved to Avery Hall. When that building was recently being almost entirely razed, people clearing out the basement found “Prexy on the Half Shell.” Betty Daniels, who is Vassar’s Historian, visited me to ask about the sculpture's history. Betty also said that the sculpture had been moved to the Loeb Art Center but that Vassar felt they needed to clarify its ownership. I could not think of anyone who would want it, so the sculpture is now owned by the college. I understand that the Ziolkowski family has recently asked to borrow it for an exhibition at the Crazy Horse Memorial in South Dakota.